Lecce To the south of Brindisi, Lecce is a city worth exploring for its Roman ruins, medieval castle and Baroque churches. The interior and exteriors of the many churches are equally ornate and make great use of the local limestone which is carved into designs of fruit, flowers and clambering vines which also decorate many of the public building throughout the city. Polignano a Mare This up market seaside resort is divided by a deep gorge which cuts through the centre of the old town and ends in a rocky beach surrounded by cliffs where people like to dive into the clear, deep sea. There are several restaurants overlooking the beach which specialise in seafood. Pass through a gateway into the old town and stroll around the maze of streets until you come to the viewing point over looking the beach and sea caves, a great photo spot. Matera For centuries, the naturally formed caves of the region around Matera were used as homes for millennia and it was only in the 1950s that the final occupants left. Today, they are being restored and this unique landscape can be appreciated. You may recognise it as it has been used in various films. Grotte di Castellana The limestone of Puglia has been worn away for 100,000 years creating caves and grottoes across the region, many of which have been turned into churches and visitor attractions. Grotte di Castellana is by far the largest with a network of nearly 2 miles. A guided tour takes around 2 hours or there is a shorter option of about 50 minutes. Ostuni The most popular of the white towns of the region, it’s located on a hill facing the sea with a mixture of wide open piazzas lined with cafes and restaurants and narrow streets and alleyways, ideal for wandering and finding souvenirs. At the heart of the old town is a very impressive cathedral decorated outside with Baroque era carvings. Climb a short way up the slope past the cathedral to admire the ornate 18th century bridge which links two parts of a former palazzo. Locorotondo A charming town, reputed to be one of the most attractive in all Italy. It’s lovely place to stroll as the sun begins to set and a joy for photographers to capture the cobbled, flower lined winding lanes and golden stone of the finely carved Baroque buildings. A few restaurants have a prime view towards nearby Martina Franca and the Itria Valley. Cisternino Set on top of a steep hill with excellent views of the surrounding countryside, Cisternino has a couple of distinctive features. Its shops are more focussed on the arts with many galleries and specialist suppliers including an upmarket chocolatier in the main piazza. The other is the high number of butchers’ shops which run a lucrative side line by becoming restaurants each evening. Simply choose from the large selection of different types of meat and it will be taken away and grilled over a wood fire for you. A truly unique experience. 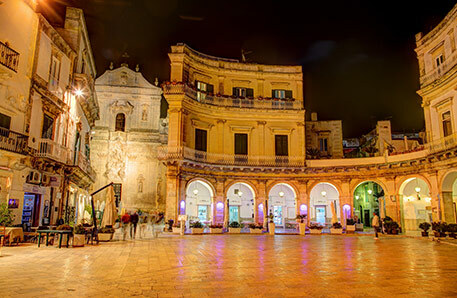 Martina Franca An elegant town with a series of squares linked by narrow winding streets which retains a friendly, small town feel. It has some very fine Baroque architecture including a palazzo with amazing frescos. The weekly market is one of the most renowned in the area. Each year from mid-July to early August, it plays host to an arts festival with classical concerts and operas. Ceglie Messapica One of the lesser know towns of Puglia, Ceglie Messapica has plenty of charm with the twisting backstreets of the historical centre a lovely place to wander and find the semi-ruined castle, churches and courtyards. There are still plenty of people living in this quarter so you can see how largely unchanged life has remained. The town is at its liveliest in the evening when the shops and restaurants open again after siesta and residents come out for a stroll and to dine. Carovigno Carovigna lies just a few miles from the coast and has a relaxed, seaside feel with palm tree lined streets. It’s worth popping into the castle which, although not very large, dates back to Norman times with various towers being added by subsequent owners. It has a great view of the sea and was inhabited until the mid 20th Century. The main piazza is lined with the characteristic white limestone buildings and is a good spot for a coffee or lunch in one of the many trattorias. There are plenty of high quality restaurants tucked down the narrow passageways or vicolos and seafood is a particular speciality.